Become an athletic trainer and work with a physically active population across a spectrum of settings, ages and activities. This program gives healthcare professionals the ability to build close working relationships with patients, and ultimately improve their health-related quality of life. If you're looking to join a dynamic profession where workdays are seldom the same, apply today. The MSAT is an accredited program by the Commission on Accreditation of Athletic Training Education (CAATE). Please refer to https://caate.net. This 24-month, year-round program is designed to exceed the CAATE standards. It provides instruction, clinical, and research experiences to prepare students to become certified athletic trainers. Emphasis is placed on didactic coursework, mentored clinical experience, with opportunities for students to pursue scholarly achievements. Students who successfully complete a degree in Athletic Training from an accredited athletic training program are eligible to sit for the Board of Certification (BOC) examination (www.bocatc.org). BOC certification (ATC) establishes the entry-level credential to work as an athletic trainer. This is an intensive, practical based program with classes 2 days per week and clinical site work 3 days per week and on weekends as applicable (e.g. sporting events). The second summer includes an immersive clinical education experience and students may choose their preferred type of clinical site anywhere in the U.S. This focus on clinical work prepares our students to be effective in their jobs right away. And positions are plentiful as the athletic training field is expected to grow 21% by 2024 according to the Bureau of Labor Statistics. Faculty are leaders in their field who consistently produce cutting-edge contributions that continue to evolve the professions. Students will have the opportunity to collaborate with faculty to produce a scholarly product. Check out our Exercise and Sport Injury Lab. Curriculum is evidence-based and clinical techniques are based on scientific research conducted by Curry faculty and are field-tested. Faculty have authored textbooks and research articles, earned grants and conducted research in the areas of therapeutic modalities; lower extremity and spine injury identification, prevention and treatment; concussion identification and management; and clinical reasoning and clinical outcomes assessment. 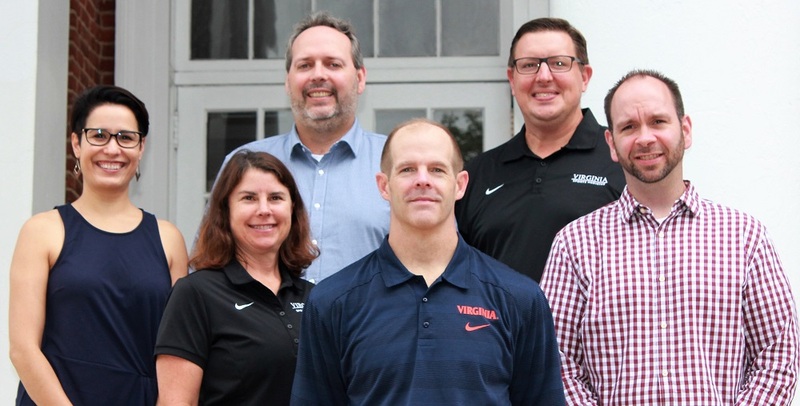 UVA has several top-tier athletic programs for clinical placements including with the University of Virginia Sports Medicine team, which uses an integrated approach to athlete care including daily access to sports medicine physicians in on-grounds clinics, performance enhancement with strength and conditioning specialist, mental health services and sports nutrition counseling. Access to the University Virginia School of Medicine and UVA Health System allows for interprofessional collaboration that enhances patient care opportunities. Curriculum is evidence-based, and clinical techniques are based on scientific research conducted by Curry faculty and are field-tested. Clinical placements occur throughout the entire 24-month program in a variety of settings, including the University of Virginia's Sports Medicine team, School of Medicine and Health System. Students will have the opportunity to collaborate with faculty, who consistently produce cutting-edge contributions that continue to evolve the athletic training profession. Faculty have authored textbooks and research articles, earned grants and conducted research in the areas of therapeutic modalities; lower extremity and spine injury identification, prevention and treatment; concussion identification and management; and clinical reasoning and clinical outcomes assessment. 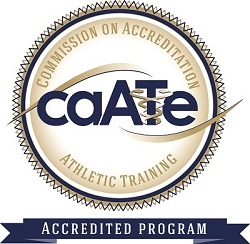 The MSAT is an accredited program by the Commission on Accreditation of Athletic Training Education (CAATE). Students complete 67 hours of coursework during the 24-month, intensive program. All courses provide instruction related to Athletic Training and related health care professions. Courses are designed to meet the CAATE standards and competencies in each content area of 1) Evidence-Based Practice, 2) Prevention and Health Promotion, 3) Clinical Examination and Diagnosis 4) Acute Care of Injury and Illness, 5) Therapeutic Interventions, 6) Psychosocial Strategies and Referral 7) Healthcare Administration, and 8) Professional Development and Responsibility. Students take 47 credits of didactic courses, 17 clinical practicum and 3 thesis or independent research credits. All students will complete a scholarly project as part of their graduate experience. All courses provide instruction related to Athletic Training and are taught by athletic training faculty for professional athletic training students. Please download the MSAT student manual containing program mission, goals, assessments, outcomes and technical standards. The purpose of clinical education is to provide opportunities for students to have clinical experiences providing patient care to real patients with a variety of condition in different clinical settings. The goal is to prepare students to be able to make timely clinical decisions to improve clinical outcomes and to maximize patient health-related quality of life. During each semester (including summers) every student will have a clinical education experience at one of our approved affiliated sites. Experienced clinical preceptors at each site provide clinical and professional mentorship. Clinical sites are available in the following settings: college/university (public and private), secondary school (public and private), physician clinic, therapy clinic, and non-traditional sporting/activity settings. In addition, the program includes opportunities to complete immersive experiences providing full-time patient care at 3-distinct time points in the program: 1.) a 3-week immersive in pre-season, 2.) a 6-week summer immersive in the summer between the first and second year and 3.) a 7-week immersive during the fall of the second year. A student may choose to combine the 6-week and 7-week immersive to complete a 13-week immersive in any location in the US. During these immersive experiences, students will have no requirements to meet in face-to-face classes. This major is a full-time cohort based major. Admission into the program is highly competitive and is based on the targeted criteria stated below. Completion of a minimum of 100 clinical hours under the direct supervision of an athletic trainer. Current CPR/AED certification (examples of appropriate CPR/ AED certification include the American Heart Association ACLS, BLS Healthcare Provider, BLS Provider; American Red Cross CPR/AED for the Professional Rescuer, Basic Life Support for Healthcare Providers). Applicants are strongly encouraged to submit their applications as early as possible. Applications will be reviewed on a rolling admissions basis until we have filled our class for the upcoming year. It is strongly encouraged to apply by February 1st. Applications will be accepted until May 15th on a space-available basis. Please read the full instructions on applying on the Curry Master's & Ed Specialists Degrees page under "Master of Science in Athletic Training". Your application process will be managed through our online system. Please note that there is no tuition waiver associated with the clinical placement - students are responsible for either in-state or out-of-state tuition depending on their Virginia residency status. Students are also responsible for their own health insurance costs. The Curry School offers scholarships on an annual basis and information regarding these scholarships can be found here. Students are encouraged to apply for federal financial aid, including work-study. Information about federal aid programs, including applying using the FAFSA, can be found through Student Financial Services. Additional financial aid information can be found on Curry's Financial Aid web page. Information regarding program specific tuition and fees. Outcomes related to the MSAT program are available here. Focus on clinical work prepares students to be effective in their jobs right away, and positions are plentiful as the athletic training field is expected to grow 21 percent by 2024. Clinical athletic training positions in a variety of health care settings including but not limited to colleges, high schools, professional sports, sports medicine centers, military, physician offices and clinical settings. Program outcomes related to BOC examination pass rates in addition to employment/placement, retention and graduation rates will be posted once the first cohort graduates in Spring 2019.